With the announcement of Rod Carew’s dire need of a heart transplant, it’s troubling to see one of the game best hitters in a tough situation. Beyond his great skill on the diamond, notably in the batter’s box, Carew embodies many qualities that many fans would be hard pressed to find in a star player. This is a reminder to fans of how truly great Carew was during his playing career. Born and raised in Panama until he moved to the United States at 15, Rodney Cline Carew (named after the doctor who delivered him – Rodney Cline) grew up listening to baseball games on the Armed Forces Network. Possessing a strong desire to be a baseball player, with a great vision for the strike zone and a strong hitting discipline he was signed by the Minnesota Twins. Carew made the Twins as a rookie in 1967, two years removed from an AL pennant and still featuring a who’s who of quality players. Playing along side future Hall of Famer Harmon Killebrew, MVP winner Zolio Versalles and stars Bob Allison and Tony Oliva, Carew proved he belonged in the show. With 150 hits, a .292 batting average and a .341 on base percentage, Carew took all but one first place vote for the Rookie of the Year. From that season on there was no stopping him. For twelve seasons as a Twin, Carew was easily the best hitter in the league. During that time in the Twin Cities, he lead the AL in batting seven times, only hit below .300 twice and was an All-Star every season. As it was noted then and even now, Carew did all of this to little fan fare. Even as he won the 1977 AL MVP, many felt Carew should have been earning more money than what he was paid by Minnesota. With the front office constantly moving most of its young talent — Graig Nettles, Bert Blyleven, Lyman Bostock, Carew demanded a trade. Traded to the then California Angels, Carew still proved to be a valued hitter in his thirties. Though he never won another batting title in his last seven seasons with the Angels, he still hit above .300 in five of them and never sunk below .280. All the while he was a set-up man for many star sluggers of the time. 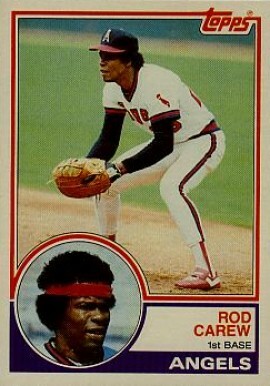 Rod Carew finished with 3,053 hits, a .328 AVG, .393 OBP and 353 stolen bases. Of those stolen bases, he stole home 17 times. It came as no surprise in his first year of eligibility, Carew amassed 401 of the 433 votes (90.1%) to get into the Hall of Fame. As Carew explains in his Hall of Fame induction speech (the same class as Ferguson Jenkins and Gaylord Perry) the awards never mattered to him. Reserving himself to the role of contact hitter, he excelled at being the premier hitter of his era. Being able to focus on getting on base, especially earlier in his career with his speed, he looked to go the other way for a single, rather than hit for power. In fact, he won the batting title in 1972 with no home runs. As a hitter, he draws so many comparisons to Tony Gwynn. The late Padres hitter made the 5.5 hole his calling card, just as Carew made a career of taking outside pitches to left field. In baseball culture, Carew left a lot of memorable items. Carew was known for his unique batting stance, with his bat laid flat, even with his left shoulder. He had the stadium rocker look on his 1983 Topps card. Carew did something else no one else has done, as he hit two triples in an All-Star Game. He even gave aspiring hitters his K-Tel Batting Trainer. Here is hoping for a donor to keep Carew with us a little bit longer. His modesty (even described on his 1989 Topps Baseball Talk Card) has only been surpassed by his brilliant hitting ability. While he never was the marquee player of his time, baseball fans should never forget the brilliant career of Rod Carew.